Email: I’m cosplaying as Integra, but I have no idea how to tie that tie she wears!! shaded cloth = scarf proper, the part that you leave tied. red = gets retied every time. 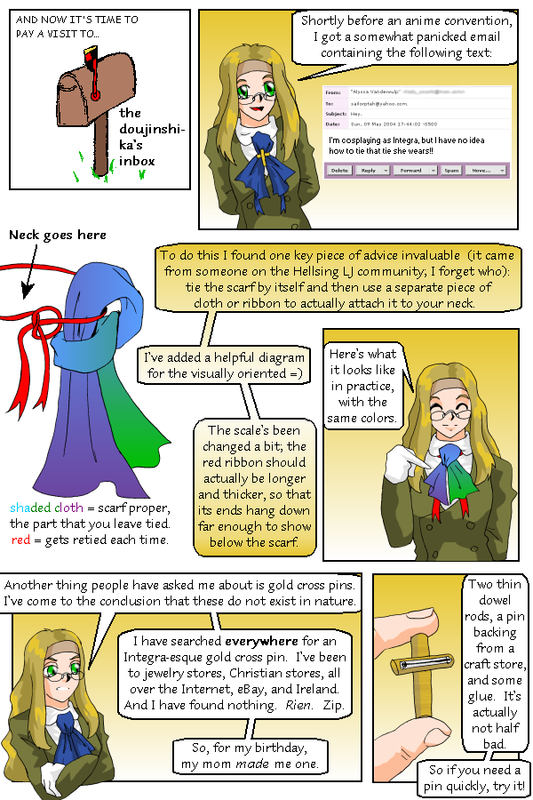 The scale’s been changed a bit; the red ribbon should actually be longer and thicker, so that its ends hang down far enough to show below the scarf. Here’s what it looks like in practice, with the same colors. Another thing people have asked me about is gold cross pins. I’ve come to the conclusion that these do not exist in nature. I have searched everywhere for Integra-esque gold cross pin. I’ve been to jewelry stores, Christian stores, all over the Internet, eBay, and Ireland. And I have found nothing. Rien. Zip. So, for my birthday, my mom made me one. Two thin dowl rods, a pin backing from a craft store, and some clue. It’s actually not half bad. So if you need a pin quickly, try it.